Kevan Jon Rhea asym strip sequin jersey dress. Draped to perfection – this stunning asymmetric dress is sure to be your wardrobe favorite for the warmer months. 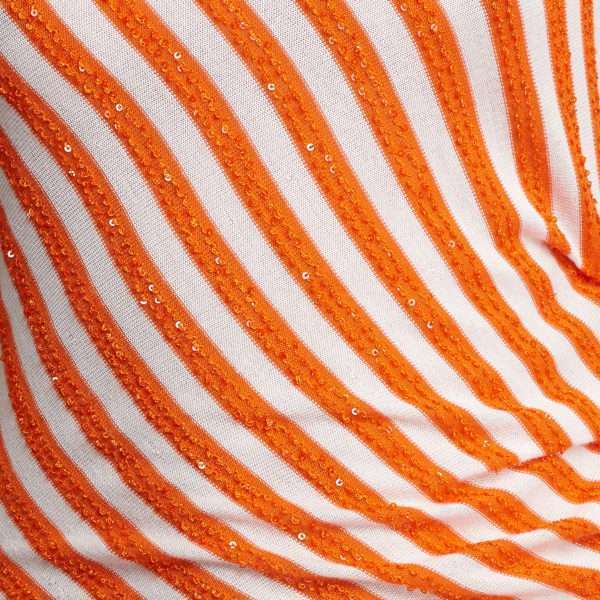 Light stretch jersey fabric adorned with subtle sequin give the dress a feeling of easy glamour and the ability to style it up for special occasions or dress it down for casual chic. Ruched at one side to flatter and accentuate in all the right places with a looser fitting top half . 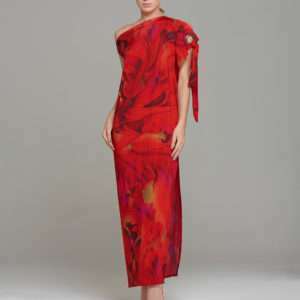 A high slashed effect neckline with a featured ruffle on one shoulder add even more contemporary interest to this dress. The placement and alignment of the striped fabric is both eye-catching and flattering making this an altogether alluring piece.